If you've been with us awhile, you've seen the company name ecoAble about half a dozen times. 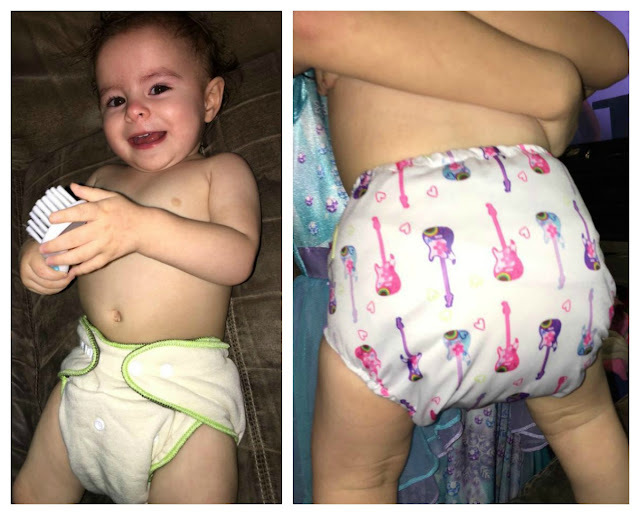 After reviewing several of their cloth diaper products, I am convinced they are my favorite cloth diaper company. Doing these reviews I have been able to try many different styles (In many different adorable prints!) and seen what worked for our family. In this installment, I will be showcasing their Stay Dry Night Fitted Hemp & Charcoal Bamboo diaper. These fitted diapers are all cloth, meaning there is no PUL (waterproof liner). Therefore they are meant to be used with a diaper cover. This system comes with an incredibly soft outer shell – seriously I was rubbing it on my face when it arrived, along with a long hemp/cotton snap in and a stay dry charcoal bamboo snap in insert. I have only used these types of fitted diapers when she was a newborn. They are typically soft and fluffy, and in my past experience, beyond adorable. I was always sad when I'd have to put a cover over a beautiful print I picked out. However ecoAble's fitted diapers are very plain – thought still insanely soft! Visually, they make me think of what cloth diapers were 'back in the day' based on what my mom has told me. When my daughter was a newborn I was able to get away without a cover. I suppose there is a bit of a volume different in the overnight pee of a 4 month old an a 18m old, however. I tested the theory and sure enough it did leak through by morning – even with both inserts. So the next time this diaper resurfaced on my rotation, I went ahead and used the ecoAble cover I had reviewed previously. It was pretty hilarious how LARGE her rump was with all of this fluff! For comic relief, I'll tell the honest struggle in true parenting fashion...After securing on the fitted, with both inserts, and added the cover, she promptly filled the inside with foul smelling substances...in less than five minutes. Once again, I had to wait for a cleaning to see it through an over night. I will say that the infraction sprayed from the diaper with much ease, which is always nice! Once we finally managed to get her into the bed with the diaper, we were able to see how well it did. Sure enough, come morning, it was still holding it all in with no leakage! We have since used it a handful of times. I prefer it without the long insert simply because of how big it makes everything. I'm afraid it would hurt her back by lifting it from the bed – I also imagine that's likely my overthinking. Luckily she isn't a big wetter though. I could see needing all the pieces parts if she had a bigger bladder, or in the future when she's older. I will say that after washing, sadly, the diaper was never quite as soft as it was taking it form the package. Maybe when the sun returns and I can do more drying outside of machine, or when I get wool dryer balls, this will bring some of its life back into it. 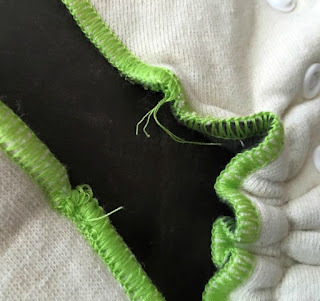 I also feel obligated to say that for the first time, there was a cosmetic issue involving the stitching that I haven't had before in previous ecoAble diapers. Granted, this is a different material than anything of theirs I've had the pleasure of owning. All three pieces had an imperfection around a sew lines closing. It doesn't impact the usage at al,l but I do wonder how it may effect the longevity of the diaper. ecoAble's sells these diapers in packs of 1 ($18.50), 2 ($35.99) and 4 ($69.99) with waterproof diaper covers sold separately. They are One size, with the customization snaps to adjust it for what's best for children between 10-35lbs. 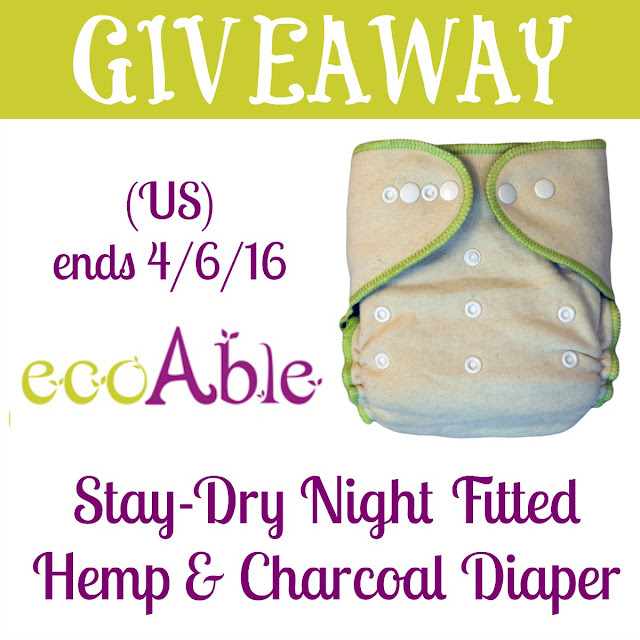 If you'd like to try ecoAble's Stay-Dry Night Fitted Hemp & Charcoal Diaper, they're allowing us to give one away to one of our US readers! Read on to see how you can enter to win! This giveaway is open to US RESIDENTS ONLY and will end just before midnight ET on 4-6. I learned that they have directions for caring for their products on their website! I love that! The Charcoal Bamboo All In One Cloth Diaper with Pocket in the Fox print is adorable! I love the Long Sleeved Bib with Crumb Catcher Pocket, Dinosaur! I love the idea of a long sleeved bib! Such a neat concept. I'm really interested in the night cloth diaper, as we do not have a night option yet! I love the Charcoal Bamboo All In One Cloth Diaper with Pocket in the unicorn print! So cute! I like the bright stars diaper. Nice to find gender neutral prints that are not pastels. I love the look of the swim diapers! It says "Ultimate Cloth Diaper for Play, Swim & Potty Training," so it is multi-function, which is great! I need to look into these for this summer! Long sleeve bibs seem like a great idea. I love the zebra print diaper and the fact that they also offer solids! I like the newborn airplane diaper. The bamboo cotton fitted looks great, too! They have directions for how to care for diapers and have a wide variety of product from diaper to trainer. Most if not all of the diapers sold by EcoAble use bamboo inserts which is awesome because it is super absorbent. Ecoable has the cutest prints! I'm intrigued by the EcoAble Ultimate Cloth Diaper. We need a swim diaper for this summer and this looks like a great option that would serve multiple purposes! I love the Long Sleeved Bib with Crumb Catcher Pocket, what a great idea! I am so in awe in how much diapers have changed in the 40 years since my kids were little! I remmber when Huggies came out! LOL! Thank you so much for linking at #overthemoon! I look forward to seeing what you share very week. Please come back for #WonderfulWednesday. Don't forget to comment your link #'s so I can be sure to visit. I really love the Bamboo All In One Cloth Diaper with Pocket, Spring because it's such a lovely print. It's been a long time since I needed to know anything about diapers. But, I will file this at the back of my mind for that glorious day when one of my children tells me I'm going to be a grandma. The charcoal bamboo AIO diapers look awesome! I didn't realize that they now have a hemp and charcoal fitted. We won a bamboo nighttime fitted from them about 6 months ago and now that I'm shopping for our new baby I know what my first choice for nighttime is. I refuse to purchase a different nighttime diaper because I love theirs for the price! It's such a great diaper. I have an ecoable diaper and I really like it. They have great prints and are very durable! I learned they used bamboo inserts. I'm very interested in their "ultimate" diaper. I like that it can pretty much be used for any occasion. I learned that your website is down, but then found out your diapers are on amazon. That's cool. I'm interested in the swim diaper. I learned more about their nighttime fitted. I'd love to try it! Have two in diapers right now. That they use bamboo inserts. I love that their are swim diapers, Summer is coming..i hope! and we go swimming a lot. little one currently doesn't have any! but I love trying new brands of diapers in general. I'd like to try their swim diaper. I'm interested in the swim/potty training diaper as its summer time and we will need one soon. I learned that they make fitted diapers! Lol...who knew! 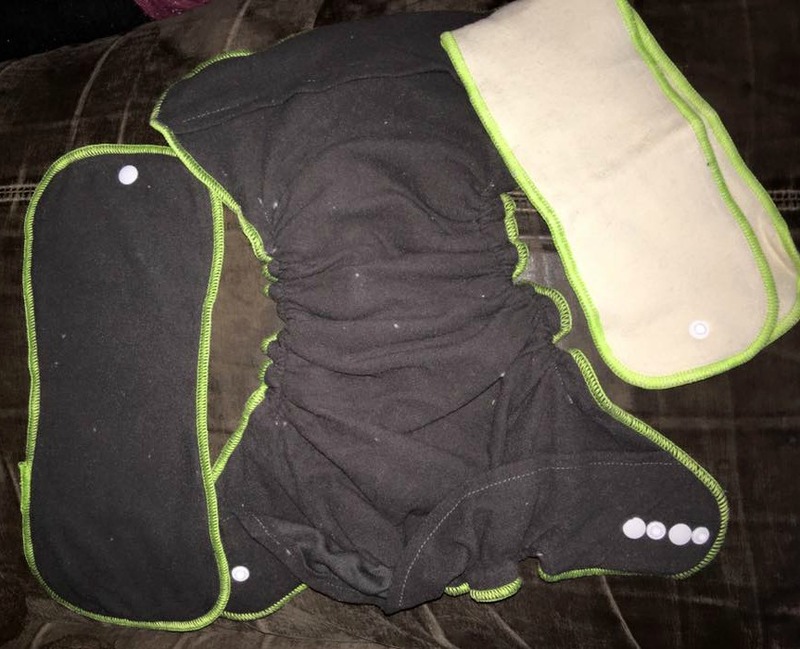 I learned that Ecoable makes fitted diapers and stay dry night diapers! Thank you so much for the give away! I learned that every time I tried the link says the store is down for maintenance! I like their swim diaper. Thanks for letting us know! Your entries will still count - good luck! The site is down at the moment. Hay, all! This is Lynda from RCHReviews! Unfortunately, EcoAble's website will be down until after this giveaway is over - but leave a comment here and note that you did on the Giveaway Tool, and your entries will still count! Good luck to you all! This looks like a great option for a night time diaper for my daughter. Currently the ones I've tried, she's leaked through. I'm interested in the charcoal bamboo inserts. The site was down for maintenance, but the diapers look very useful! I like the potty training pants.